Malthus, Thomas Robert (1999). Gilbert, Geoffrey, 編. An Essay on the Principle of Population. Oxford world's classics. Oxford University Press. 第 208頁. ISBN 978-0-19-283747-9. 喺2010-02-12搵到. 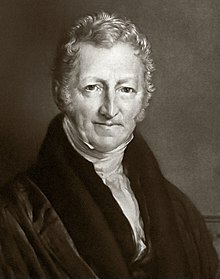 Thomas Robert Malthus (1766–1834). The Concise Encyclopedia of Economics. Library of Economics and Liberty (第2nd版). Liberty Fund. 2008.